Fourth novel in the “Memory, Sorrow and Thorn” series of fantasy books written by Tad Williams in 1993. 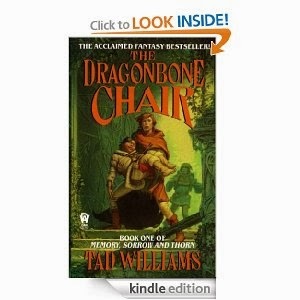 This month marks the 25th Anniversary of the publication of Tad Williams’ fantasy novel, The Dragonbone Chair, Book One of “Memory, Sorrow, and Thorn.” The epic series begins as the story of a simple castle servant named Seoman who stumbles upon treachery as nonagenarian King John lies dying. The book went on to become a nationwide best-seller in the US. A war fueled by the dark powers of sorcery is about to engulf the peaceful land of Osten Ard–for Prester John, the High King, slayer of the dread dragon Shurakai, lies dying. And with his death, an ancient evil will at last be unleashed, as the Storm King, undead ruler of the elvishlike Sithi, seeks to regain his lost realm through a pact with one of human royal blood. Then, driven by spell-inspired jealousy and hate, prince will fight prince, while around them the very land begins to die. Only a small scattered group, the League of the Scroll, recognizes the true danger awaiting Osten Ard. And to Simon–a castle scullion unknowingly apprenticed to a member of this League–will go the task of spearheading the quest for the solution to a riddle of long-lost swords of power…and a quest that will see him fleeing and facing enemies straight out of a legend-maker’s worst nightmares! Williams’ series went on to inspire George R. R. Martin to write “A Song of Ice and Fire,” which was adapted for television as Game of Thrones.